Membership to the Quies SBPCLC, is founded on a communially supervised commitment to the eleven guidelines and to the ensuing customs and statutes of the projected lay association. The Quies SBPCLC project's purpose is to collegially help to study, live and apply the eleven guidelines, progressively in our own lives; as was proposed by the Reverend Father; a task that solicits in itself our own personal conversion into the authentic charism of Saint Bruno, in communion with the Carthusian Order's monastics, and that "may take several years, which is not at all serious, since we are working on the long term" (Gd 11). The Quies SBPCLC members participate in and serve the community of the founding CLC, IFSB/SBLC spiritual ecosystem, and all it's eventual affiliates; while understanding it's own particular mission or vision as being: to individually and communially apply the Quies SBPCLC 5 steps commitment to the eleven guidelines. Aspirants individually applying the Quies SBPCLC 5 steps commitment to the eleven guidelines are thus proposed to commit themselves to a regular community life: it instigationally is, and potentially continues to be, experienced through IFSB/SBLC forums and meetings; but evidence is developing that applying the Quies SBPCLC 5 steps commitment to the eleven guidelines requires the availability of a more specifically dedicated SBPCLC community life. Video-conference meeting(s) could be agreed upon to answer questions and initiate discernment; in view of facilitating eventual SBPCLC regular small group contacts (Gd 4). 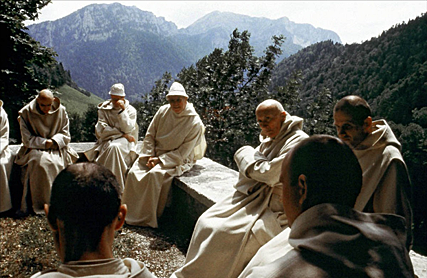 Following Saint Bruno's charism and in faithfulness to the 11 guidelines, SBPCLC regular small group contacts membership is expected, and will be managed, to consist of a limited number of individuals, as in a carthusian monastery. The solitary life, in the cell or the obediences, enkindles and nurtures in our hearts the fire of divine love, which is the bond of perfection, and makes us members of one body. We express this love that we bear for one another when we come together, as a community, showing by our words and behavior our joy at meeting our brothers, and our willingness to forget ourselves for them. The Sacred Liturgy is the noblest form of community life, since it establishes the deepest and most intimate communion among us. When we join in it each day, we have but one heart and one soul, as we present ourselves before God. The Chapter House is a place well worthy of our esteem. Therein it was that we asked to be received as the very humble servant of all; therein, too, we avow our faults in the presence of our brothers; and therein, also, we hear spiritual reading and discuss matters pertaining to the common good. On certain solemnities, we all meet in Chapter to hear a sermon from the Prior or from whomever the Prior appoints. After None on Sundays and solemnities — with the exception of the solemnities of Christmas, Easter and Pentecost and those that fall on weekdays in Lent — we go to the Chapter House to hear a reading from the Gospels or from the Statutes. Every second week, or once a month, according to the custom of the House, we publicly avow our faults there. Each person can confess faults committed against his brothers, the Statutes, and also against the general obligation of our engagement. And since solitude of heart requires for its preservation the wall of silence, he who breaks silence must always proclaim his fault and perform some public penance in accordance with accepted procedure. When the accusation has been made the Prior can opportunely give admonitions. On Sundays, at a suitable time, the brothers are to meet in Chapter, or in some other place, where they will hear a reading and an explanation of the Statutes, or else a father, appointed by the Prior, will instruct them in Christian doctrine. They will also proclaim their faults, unless they have already done so with the fathers. When some matter has to be discussed, or if the Prior wishes to have the advice of the community, the monks, at the request of the Prior, will assemble in Chapter. We take dinner together in the refectory on Sundays and solemnities on which days we meet together more frequently, so that we may taste something of the joy of family life. The refectory, which we enter after an Office in the Church, brings to mind the Last Supper, a repast which Christ hallowed. The tables there are blessed by the celebrant of the Conventual Mass; and while food for the body is being served to us, we are at the same time spiritually nourished by the reading of things divine. A period of conversation is accorded the fathers after the Chapter at None; the Prior can grant this to the brothers who desire it on any solemnity. Once a month, however, there is a recreation for all the brothers; on this day, if the Prior so wishes, fathers and brothers may have a common recreation, to which even the novices and junior professed may be invited. At recreation, let us remember St. Paul’s exhortation: rejoice, be of one mind, have peace, so that the God of peace and love may abide within us. Since a colloquium is an assembly together of the community, let us not separate ourselves from the main body; nor should we speak elsewhere, but only there where all are assembled — except, perhaps, a few words. Since, as St. Bruno says, when wearied by our quite austere rule and application to spiritual things, our rather delicate natures can often be refreshed and renewed by the charms and beauties of woods and countryside, the fathers have a walk every week — with the exception of Holy Week. The brothers are to have a similar walk every month, at which, however, attendance is optional. But they must take part in the walk at least three or four times a year. Fathers and brothers can take this walk together, at the discretion of the Prior. In accordance with a very old custom of our Order, an exceptionally long walk is granted once a year, which the fathers and brothers, and also the junior professed and novices, are permitted to have together, if it seems suitable to the Prior. On this walk, it is permissible to go beyond the limits assigned by the General Chapter, and also to bring something to eat. However, Carthusian frugality is to be observed; when eating, we must be well-removed from strangers. The Prior is allowed to grant another walk of this kind, on which we do not eat, however. Our walks should be such as to further brotherly union and also the spiritual progress of our souls. Hence all are to walk together, taking the same route so that each one can, in turn, talk with the others — unless, for a reasonable cause, it seems better to have two or three groups. Should it be necessary to go through a town or village, they will be content simply to pass through, preserving due decorum, nor may they ever enter the houses of seculars. They should not hold conversation with strangers, nor give them anything. On the walks, we are not to eat or drink anything, except plain water, found by the wayside. These conversations together are intended to help us to grow in mutual love, and to moderate somewhat our solitude. Let us be on our guard against talking excessively, or shouting, or indulging in indecorous laughter. Let our conversations be religious, not frivolous or worldly; sedulously let us shun even semblance of detraction or murmuring. Should a difference of opinion arise, let us know how to listen and to see the matter from the other’s point of view so that in all things, the bond of mutual love will grow ever stronger. Opera communia may be held three times a year at the discretion of the Prior — who may also, if he wishes, omit them entirely. This work in common — during which silence is to be observed in the manner prescribed in chapter 5.6 — may be continued for three days. As well as work which the Sacristan might require, the Prior may enjoin something of assistance to the brothers; if so, the fathers will be very happy indeed to have this opportunity of participating in the ministry of the brothers. In the week of opera communia, the walk is optional for the fathers. Any fathers who so desire, may, once a month, with the Prior’s consent, devote the time of the walk to some work, in the manner prescribed for opera communia, yet with permission to speak.